Four weeks, and I'm just finding out. I tested on the appropriate day and it was negative, so I had more or less given up, until I felt randomly terrible one Thursday evening and started to wonder. I got the faintest positive line on Thursday night's test, so I wake up Friday 8/21 to use my last digital. I realize that, no matter how well planned and longed for a pregnancy is, seeing the positive appear on the test will ALWAYS bring about a mix of emotions. Elation, terror, joy, dread. After debating telling anyone, I end up telling basically everyone except work and the Internet (but don't worry Erin, you were the first). I know that, if this pregnancy doesn't progress, I will want to talk about it and will need to surround myself with a support network. Five weeks, and it's still sinking in. Running is immediately hard - I am slow and struggle with every breath. Nausea hits now and then, and I could easily sleep 10 hours a night. I gain 3 pounds instantly, just like last time. None of my pants fit already, which is unsettling, but I resign myself to maxi skirts for the next 35+ weeks. Six weeks, and Amaliya somehow knows. She's extra clingy, snuggly, demanding my attention even more than usual, and asks me over and OVER again, "when will there be a baby in our family?" "Where is my little sister?" "When my brother and sister are here (because she insists there will be two, yikes!) I will help you carry them and help them learn how to slide at the park." She pointed at me, out of the blue, and said, "Mama, there's a baby growing in your belly!" It's adorable, and amazing, how perceptive she is. I have two days during the week where my energy levels are high, my stomach is settled, and I feel relatively normal (though HUNGRY, all the time). Out of nowhere I have an excellent run - 10 minute miles, feeling strong. I am hopeful that this pregnancy will be like the last, and I will escape the worst of morning sickness. Seven weeks, and this pregnancy is nothing like the last. I rallied for a family outing to Oak Glen on Saturday morning, but spent the rest of labor day weekend on the couch fighting the urge to vomit. My fatigue is so pronounced that I feel like I'm always moving in slow motion. All week, I feel faint if I don't eat every two hours, but even the thought of food makes my stomach flip-flop. I realize that the feeling is familiar - I am reminded of Mombasa, when I went out on the Indian Ocean with friends and a guide in a rickety wooden dhow. I was so seasick that I ended up jumping overboard and swimming back to shore alongside the boat, to avoid passing out or losing my lunch. There's no getting off of this boat, though. The only thing that seems to help is Sobe Lifewater or Vitamin water, which I suspect has something to do with the B vitamins. I pound bottle after bottle of the stuff, and a random bag of Maple Bacon Kettle Chips because they were the only things that sounded remotely good. I wish I could live on gouda sandwiches. Eight weeks, and it's rough. The thought of cooking fills me with dread and makes my stomach churn - all day long, I have anxiety about making dinner. Nothing sounds good, but I have to eat all the time (any thoughts of gaining less weight this time around quickly fly out the window). There are a few days I have energy, otherwise I am horizontal as much as possible. Amaliya is wonderful - more than happy to lay on the couch with me, asks me all the time if I'm not feeling well, and snuggles up to the baby in my belly when watching TV. On Friday this week we see my midwife for the first time. An ultrasound revealed ONE baby (whew), measuring right on track and with a visible heartbeat. I didn't realize how anxious I'd been until I saw that little flicker on the screen - it was reassuring to know that all is well so far. Nine weeks, and my energy starts to come back just in time. We spent the last half of the week in Austin, TX. My body felt surprisingly good walking miles and miles around town, and without the need to cook my own meals and see my dirty kitchen, my stomach is relatively settled. The lack of responsibility lifts a huge weight off my shoulders, and the absence of stress (especially knowing that Amaliya is having a great time with my parents for five days) is a huge boost to my physical and mental well-being. I start to feel more like myself. Ten weeks, and I dry-heave pretty much the entire day after I get back from TX. It's definitely cooking and the kitchen that sets me off. Cold quinoa salad sounds amazing, so I make myself a buffet-sized vat of it and eat it all within 2 days. Runs are hard, and weightlifting wipes me out, but I feel okay to keep going with both and so I do. Nothing fits, and people are starting to speculate (both to my friends and to my face) so I tell work and the rest of the world that I'm pregnant. By the end of the week, I feel like the worst of the nausea has passed. Beyond some fatigue, worsening headaches, and round-ligament pain, I am feeling more like myself (a weirdly emotional version of myself that cries over radio shows while driving to work, but nevermind that). Ten weeks gone, 30 to go. 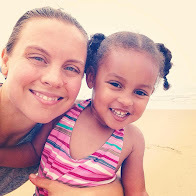 I didn't document much about my first pregnancy, aside from a few scattered blog posts. Partly because I didn't use social media as much back then, and also because my head was spinning the entire time. Everything was new and unfamiliar, so rather than reflecting I just took each day as it came. This time? I am trying to pause, take stock, and be more aware of what is happening in my body and with my family. This pregnancy feels sacred to me for several reasons - because all pregnancies are, but also because this may very well be my last, and because it marks the end of Amaliya's stint as an only child. I am stopping to savor reality, to feel it, as often as I can (even though it hasn't felt entirely pleasant the last few weeks). I'm very much looking forward to relaxing and enjoying every minute of this pregnancy, until the day we finally welcome our newest family member to the world.